Race to Nowhere, a recent documentary on the topic of overworked, overloaded and overwhelmed students, mentioned this as one of the most serious detriments to student health. Not only do they spend several hours outside of school each day studying and working, but they are often pushed to their physical limits as well. A good post on a little-discussed topic. Thanks Didara, for your concerns about the children’s health and physical appearance. In fact, you have raised one of the alarming issue which is happening in Kazakhstani public schools. As the schoolchildren promoted from grade to grade, the number of books in their bags starts to increase. 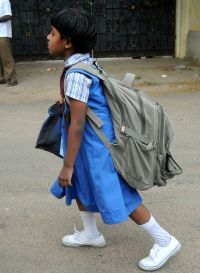 However, students do not have to carry all their books home after classes in private schools. They leave most of their books in their lockers, which are located inside their classrooms. Because they do their homework at school and bring home only some of their books. For those parents whose children attend public schools, I suggest negotiating with the school principal and buying lockers to their kids. I think it is worth trying! I grow up as your little brother! Me and my friends were carrying the whole seven or six (per day) books every, when I studied in a mainstream school. However, it did not make me exhausted or frustrated student. In contrast, I felt a physical power, which made me healthy individual. I never was ill in my childhood. Then, I was accepted for gifted school, as miss Zhadyra mentioned, there was no need to carry heavy bags. I started to starve without physhical exercises. I suppose, carrying a bag was one the part of my physical activity. Now I grow up. Sometimes I carry heavy packages, sometimes not. Feeling tired proves that I live with a full life.